A face with tightly-closed (boomerang) eyes and jagged mouth. 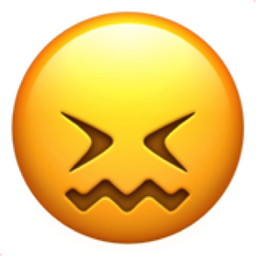 This emoji is beyond confused and has crossed over to the point of being down right angry. Dam this emoji! This is the Fail face! Confused, frustrated, bewildered. To Fail. iEmoji old name: Starting to Cry. An expression that crying is inevitable.